George Thomas Hazleton, 63, suffered a massive heart attack and passed away in his sleep on March 14, 2006 at his home in Oceanside, California. He is survived by his wife, Anne Marie, sons Geoffrey Hazleton of Columbus, Ohio (from his first marriage to Zoe Hazleton) and Christopher and Nicholas Hazleton of Oceanside, sister Capt. Nancy A. Hazleton (USPHS, ret.) of Tucson, Arizona, aunts Mrs. Claire Pelich and Mrs. Eleanor Babcock, and many cousins. His parents, George C. Hazleton and Verna M. Hazleton, preceded him in death. Tom was born at the Monterey Hospital on September 27, 1942. He was all of five years old when he gave his first performance. The boy had been listening to his kindergarten teacher play the piano for her students when he stopped her. "Teacher, you're playing it wrong," he said. "Well then, you come play it," the teacher said. And so he did. Amazed, she urged the child's mother to start him in lessons. "He was definitely a child prodigy," said Mimi Hazleton, Tom's wife of 31 years. "The organ took up his whole life." Tom studied piano with Robert Forbes of Carmel. He began playing the pipe organ at First United Methodist Church in Pacific Grove when he was 13 years old and was staff organist at Carmel Presbyterian Church, and organist and choir director at St. Mary's By-The-Sea Episcopal Church. Tom graduated from Pacific Grove High School in 1960. He attended the San Francisco Conservatory of Music, San Francisco State University, and the Curtis Institute in Philadelphia. He also studied with Richard Purvis and was assistant organist at Grace Cathedral. Hazleton was organist and music director from 1969 until 1975 at St. Mark's Episcopal Church in Palo Alto. Mrs. Hazleton met her husband in Palo Alto in 1969, when Mimi, a singer, auditioned to be his soloist. "He was working with the children's choir, and I liked the way he handled them. There was discipline and there was kindness there." The couple married in 1975. Hazleton was organist and associate minister of music for 14 years at Menlo Park Presbyterian Church, as well as professor of organ at the University of the Pacific in Stockton. 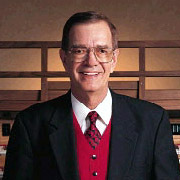 He enjoyed a world-wide reputation as a peerless classical and theatre organist and was named "Organist of the Year" in 1986 by the American Theatre Organ Society. In 2003 the ATOS inducted him into their Hall of Fame. Tom performed on most major classical and theatre organs, including Grace Cathedral, Balboa Park, Crystal Cathedral, Wanamaker's, Riverside Church, St. John the Divine, Radio City Music Hall, Washington National Cathedral, and Notre Dame de Paris. He recorded over 60 LPs, cassettes, and CDs. He was affiliated with the Allen Organ Company for more than 20 years. When news of Hazleton's death reached the organ world, several friends posted their thoughts on the Internet. Christian Elliott wrote, "Tom's sense of humor was always present in his music and his life. He used to talk about his hymn playing and say, 'We're going to do a key change and take 'em to glory!' He did indeed take us all to glory so many, many times over a wonderfully creative, glorious, beautiful, musical life." "As organists, we all have our heroes," Walt Strony wrote. "Tom Hazleton was mine. To me, he was the one organist that represented the best of the best."